Templates can be deleted either individually or in bulk. Note that deleted templates cannot be restored by the user — if you need to recover a deleted template, please email support@goformz.com. To delete a single template, navigate to the Templates Tab, expand the [...] Actions dropdown next to the template you wish to delete, and select Delete. Click Yes in the confirmation dialog that appears. The template will immediately be removed from the list. 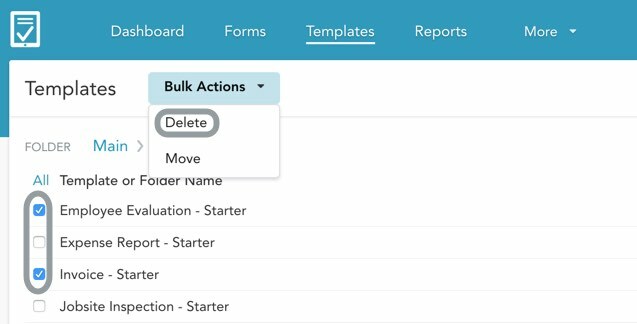 To bulk-delete multiple templates at once, navigate to the Templates Tab and check the boxes next to the templates you want to delete. The Bulk Actions menu will appear at the top. Select Delete from the menu, then click Yes in the confirmation dialog that appears. The selected templates will immediately be removed from the list.